RURAL Ireland is alive and well but needs investment in broadband and roads if it is to grow further, Mairead Lavery told last week's launch of the Tullamore Show. Editor of the Country Living section of the Irish Farmers Journal, Ms Lavery is a native of Co Wicklow who lives in Limerick. She was a special guest at last Wednesday's evening for sponsors in the Bridge House Hotel, Tullamore. When she was growing up in a rural part of south Wicklow, Tinahely was the show her family attended. 'You'd be looking forward to it for the whole month of July, it'd be happening on the Bank Holiday in August and you'd be talking about it for the whole month afterwards,' she said. When she married and moved to Limerick the annual show in Cappamore became her local event. She urged people not to be despondent about rural Ireland, pointing out that even the term 'rural Ireland' was beginning to have negative connotations. It conjured up images of isolation, the closure of shops and Garda stations and the gradual withdrawal of services taken for granted by people living in big urban areas. Ms Lavery referred to research she had carried out on the 1911 census in Shanagolden, Co Limerick. The occupations of those living in the village then included saddlemakers and nailers and weavers and blacksmiths. 'None of those jobs exist today but the village is still there. The school is still thriving, there's a creche, there's a good supermarket, there's a couple of pubs,' she said. Figures from the Central Statistics Office also supported the contention that rural Ireland is healthy. A total of 1.8 million people live in rural areas in this country and when towns of under 5,000 in population are added to that, the figure increases to over two million. 'That's a lot of people. So we're not talking about the lights going out around rural Ireland. Far from it,' she declared. 'I believe rural Ireland has the capacity to become a global beacon of balanced living,' she added. The education system in particular was very good, she stressed, saying that the Institutes of Technology were play an especially important role. 'Young people from rural areas have very high achievement rates in third level education,' she said. While some young people did wish to leave their rural home area and move elsewhere, many were deciding to return. Ms Lavery also pointed to the prohibitive cost of accommodation in Dublin. Her own daughter and son-in-law were paying €1,260 a month for a one-bedroom apartment while her son in Monaghan was only paying €200. 'We have to really start looking at what rural Ireland has to offer,' she said. The journalist also hit out at the emphasis on the benefits of foreign direct investment (FID) in this country. She said 99.8 per cent of enterprises employ less than 50 people and over 65 per cent of people employed in the country are in those same micro businesses. 'Many of them are here tonight in this part of the country and many of them will be stand holders at the show,' she stated. Connectivity with fast, reliable broadband and good roads are major challenges facing rural-based small businesses. While the roads had improved, and she said Tullamore was very accessible, the road structure 'isn't joined up' and she challenged people to try to drive from Limerick to Waterford or Limerick to Cork or on any of the 'non radial' routes out of Dublin. 'High speed broadband has the capacity to absolutely revolutionise employment and opportunities in rural Ireland,' she said. Last year Irish people spent €6 billion on line and that expenditure is expected to double by 2020. 'Are we going to allow rural Ireland to fall behind here and get delayed year after year and our entrepreneurs and those micro businesses employing less than 50 people be denied that opportunity?' she asked. The agri food sector provided a much better return to Ireland than other sectors and Ms Lavery said it makes 80 per cent of its purchases locally, compared to 15 per cent by the FDI sector. 'The Googles and the Facebooks and all the rest of it. They're sending all the money out of the country and they're not paying much tax on it,' she said. SPONSORS and organisers of the Tullamore Show gathered in the Bridge House Hotel last Wednesday night for the launch of this year's event. The Tullamore Show and AIB National Livestock Show will take place in Blueball on Sunday, August 13 and a crowd of 60,000 is expected. New show chair, Brenda Kiernan, the first woman to hold that position since annual shows were established in 1991, announced a number of improvements and additions to what has grown to become the largest event of its kind in Ireland. The Charolais Society has chosen the Tullamore Show to stage their national show for the first time. By doing so, the Charolais Society joins the Limousin, Hereford and Simmental societies in holding their national shows at the Tullamore event. 'This livestock section is getting bigger and bigger so we must be doing something right,' said Ms Kiernan. There will be 40 classes in the Dairy section, 170 classes in the Pedigree section and a total of 14 national livestock show championships. 'There will be intense competition in all classes throughout the day to qualify for a chance of winning one of the much sought after gold and silver medals in each section,' said the show chair. The Angus Calf Champion is another new competition and it will have six classes with €1,000 prize money for each class. There will be four regular classes for Salers along with the All Ireland Salers Calf Championship. While livestock remain at the heart of the show, there will be a range of competitions across nearly 1,000 classes in all, including horses, sheep, pigs, dogs and poultry, plus horticulture, cookery, arts and crafts, inventions, fashion and much more. Altogether, competitors will be battling for a slice of the show's biggest ever prize fund, clocking in this year at some €175,000. Ms Kiernan acknowledged that without the support of the sponsors, the show literally could not go on. 'A show will not run without its sponsors. If you have sponsors and you have good prize money you will bring [entries] from the four corners of the Ireland,' she said. 'If you have your sponsors you will have competitors and if you have good competition you will have the attendance. She said the Tullamore Show is the biggest one-day show in Ireland and one of hte largest in Europe. Indeed, it has become well established on the international calendar in recent years, bringing visitors from Europe, Canada, the US and elsewhere. Ms Kiernan revealed that some Americans have even organised their holidays in Ireland around the Tullamore Show. Two years ago, when she was running the Cookery section, she met visitors from Minnesota. 'They had organised 40 of a group to come on holidays in Ireland and make Tullamore Show the feature of their holidays. We want more of this. So, keep coming!' she declared. 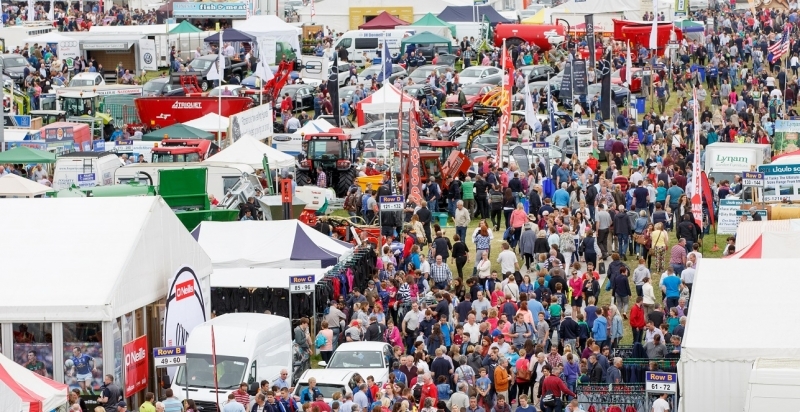 After another year in which there were too many farm accidents, safety will once again be emphasised at this year's show. 'The FBD, the HSA (Health & Safety Authority) and the FRS are joining forces once again to highlight the dangers and loopholes attached to all types of farming, whether it be with animals or machinery,' said Ms Kiernan. She recalled how her predecessor in the chair, Rodney Cox, had himself been the victim of a farm accident. 'He injured his knee with the kick of a cow two years ago this coming July. We can never be too careful and we never know what's down the road,' she said. She stressed that Tullamore Show will have something for all the family and said Odlums are the main sponsors of the Cookery and Food section. There will be extensive entertainment and attractions in the show marquees while the star musical performer will be the singer Declan Nerney. 'All the indoor sections are a huge attraction with competitors, young and old, vying for the many prizes,' she said. With classes covering everything from little pin cushions to big patchwork quilts, vegetable competitions, photographic exhibitions, and numerous cookery tests, the tents will as packed as ever, with a 'Talks, tips and hints' marquee added this year. 'As chair, I am only a front to represent the hardworking executive committee and huge numbers of volunteers who join together to organise and orchestrate this magnificent show,' said Ms Kearney. Show secretary and operations manager Fred Kinnarney heads up the organising team and Chelsea Cox is the office manager in Tullamore. Main sponsor AIB Bank has been associated with the show for 15 years and Kevin Kelly, manager of the bank's Tullamore branch, praised the innate sense of community and innovation among those involved in the event. 'Events like this are perhaps more important now than ever, particularly when you consider the degree of change and uncertainty we find ourselves in following Brexit and the election of Donald Trump to the White House,' said Mr Kelly. Mr Kelly said AIB had recently appointed 21 regional 'Brexit advisors' to work with its small business and agri customers. The show will once again be held on the Butterfield Estate land of Stephen and Annemarie McQuade and Johnny Butterfield attended the launch last Wednesday. Further details about the show can be found on www.tullamoreshow.com and on the Tullamore Show Facebook page.